Providing basic city services is a responsibility of municipal governments that stands the test of time. Potholes will always need to be filled, trash will always need to be picked up and streets will always need repaving. We will always want someone to pick up the phone when a resident calls asking for a tree to be planted, a park to be cleaned or a light to be fixed. But -- just because a service has been provided for a long time in one way, doesn't mean it's the only way. Here in Boston, we are utilizing the tools and resources of today to improve city services and make life better for those who live, work and play in our city. Last week, I gave a TEDx talk, "What Government Can Learn From Baseball," about how Boston Mayor Martin J. Walsh leads with a vision for a 21st century government, using data and technology to empower us to deliver on services better than ever before. 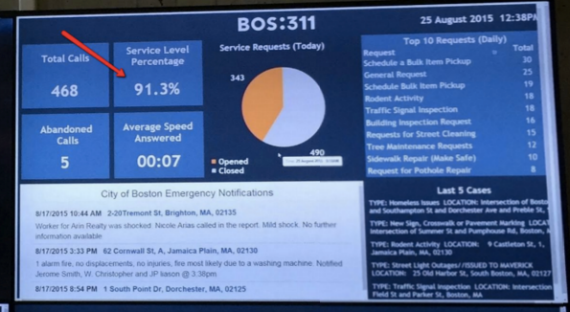 In the talk we announced "CityScore," a way for Boston to track all of the services being offered in the city right now and give us a real-time indication of our performance. The city of Boston is a $2.8 billion organization. If it were in the private sector, it would be a Fortune 1000 company and deeply data driven. Perhaps no better example of how data can be used effectively is the 2002 Oakland A's, who, as chronicled in the book Moneyball: The Art of Winning an Unfair Game, won 103 games, at one point 20 in a row, using analytics. So we studied Baseball's data-driven approach, and its evolution from using simple equations like batting average (hits/at bats) to advanced metrics like wins above replacement (WAR) ((Batting Runs + Base Running Runs +Fielding Runs + Positional Adjustment + League Adjustment +Replacement Runs) / (Runs Per Win), that give a simple number, telling teams how many more wins a player is projected to bring in than a replacement player. Several times a day, Mayor Walsh looks up at that percentage to make sure it's above 90 percent. If not, he will pick up his phone to speak with the call center manager and make adjustments. So that's batting average. But we're trying to take it to the next level and take the advanced analytics of baseball and apply it to the public sector. We're trying to take all of the metrics we track and roll it up into a number that we can take action on. 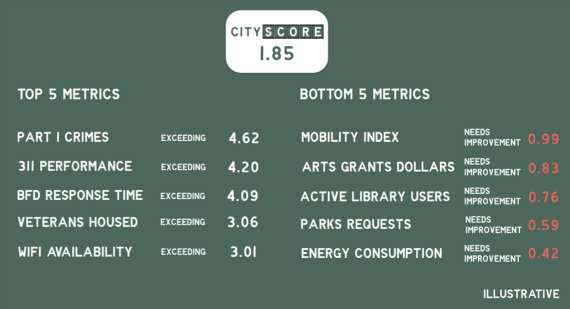 This is "CityScore." 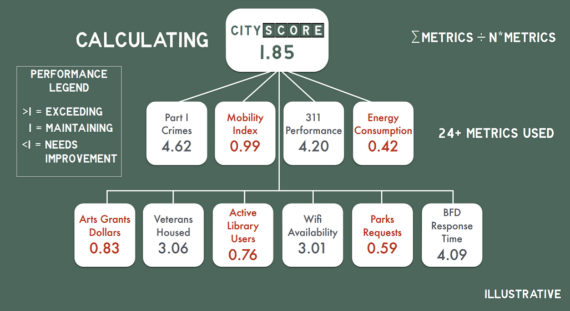 Issues facing any city -- from crime to wifi availability -- that roll up into a single number. Each will be able to see key metrics of their department, but also the score, helping them better understand the analytics. Mayor Walsh will be able to see the roll-up score -- and other individual metrics as needed -- but he will also be able to see where we are exceeding expectations and, most importantly, where we need the improvement. 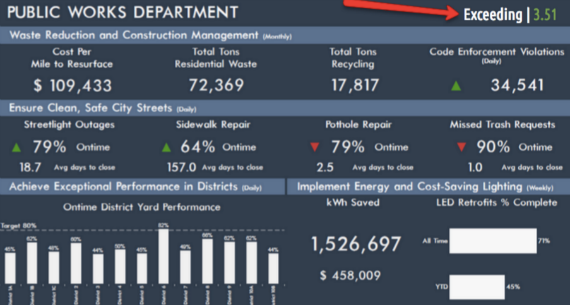 There are opportunities to use data to improve city government are limitless, and we are dedicated to continuing to find innovative ways to apply analytics to the way we work. Right now, we are looking at how to target opioid use through data, and finding landlords on Craigslist who are selling their units at overcapacity and endangering their tenants. Fancy talk about data and apps will never serve as the sole solution in city government and we strongly believe that nothing will ever replace being in our neighborhoods, meeting people and hearing first-hand of their concerns. It's what we do with the data that makes this so important for us to pursue. It's our goal that, with real-time data at their disposal, we will be able to identify and address problems as they happen or even before. With the technology available to us today, it's our responsibility to do so. And most importantly, we want to partner with others to figure out how to do better, and share what we are doing in Boston. So e-mail me at daniel.koh@boston.gov. Help Mayor Walsh (and your city's Mayor) make government better, one hit at a time.